With a trademark powerful stride amid a blaze of red and yellow silks, Justify emphatically crossed the finish line at the 2018 Belmont Stakes and became just the 13th winner of horse racing's elusive Triple Crown. One of the most charismatic and talented runners in the history of the sport, Justify was also one of its most unlikely champions; the late-blooming chestnut colt made his competitive debut only 111 days prior to that legendary victory. 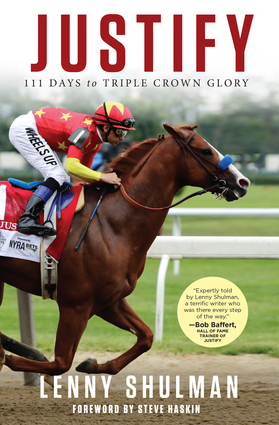 In Justify: 111 Days to Triple Crown Glory, veteran scribe Lenny Shulman (BloodHorse magazine) provides an insider account of this Thoroughbred's rise to greatness. Through extensive interviews and first-hand accounts, readers will discover the fascinatingly disparate cast of characters who were crucial to Justify's success, including trainer Bob Baffert, whose innate ability to identify equine talent also produced American Pharoah; Mike Smith, the 52-year-old jockey asserting himself in the miraculous third act of his career; and breeders John and Tanya Gunther, who believed in Justify's ability despite the developmental imperfections that drove buyers away. Packed with riveting action, keen insight, and behind-the-scenes perspectives on quieter figures like silent investors, international stakeholders, and unheralded training staff, Justify is an illuminating look at the modern Thoroughbred industry and an essential story for the ages. Lenny Shulman is an Emmy Award-winning writer who has worked extensively in TV and film as well as for magazines and newspapers across the country. For 20 years he has served as features editor for BloodHorse magazine, the Thoroughbred industry's foremost trade publication. He is the author of Ride of Their Lives: The Triumphs and Turmoil of Today's Top Jockeys.Steve Haskin is a longtime Turf writer who has covered horse racing for 42 years and the Kentucky Derby/Triple Crown for 32 years. He has written six books on the sport, won numerous awards including six Red Smith Awards for his Kentucky Derby coverage, and in 2016 was elected to the National Museum of Racing's Hall of Fame Media Roll of Honor.